WILLEMSTAD - The fifteen trade unions in Solidaridat Sindikal are divided. The Isla unions (oil refinery) are deliberating whether they will continue with the actions or not. The actions have taken a long time and, according to the union leaders, there comes a time when you just have to stop. 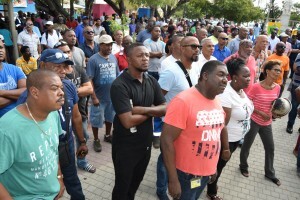 Solidaridat Sindikal, under the leadership of Errol Cova, continued their actions today that started at 7 am at the trade union building PWFC. Yesterday there weren’t many people and it today was the same, especially now that the oil refinery unions did not participate.